This paper presents the computer simulation of ultrasonic non-destructive testing of concrete. The numerical modeling tool uses a geometry generator which generates a surface or volume material model on a discrete grid system in 2-D or 3-D and models the very heterogeneous character of the concrete material which consists in general of cement, a random distribution of several aggregates, and a certain water/air concentration. The propagation of ultrasonic waves in such a random material exhibits a complex mixture of multiple mode conversions and multiple scattering effects as well as absorption effects. In order to model these effects we apply the Elastodynamic Finite Integration Technique (EFIT). For the numerical simulations in 3-D we developed a Message-Passing Interface (MPI) version of our EFIT code. Results are presented by means of time-domain data like snapshots of the ultrasonic wavefield. Appropriate and successful modeling with EFIT can also be utilized by an interactive design procedure for concrete test specimens as well as the synthetic data can serve as a test bed for imaging algorithms like the Fourier Transform-Synthetic Aperture Focusing Technique (FT-SAFT). For the quantitative numerical modeling of ultrasonic waves in concrete we apply the Elastodynamic Finite Integration Technique (EFIT) [3, 12]. Fig. 1a shows a cross-section of a typical concrete sample. The concrete material can be modeled by a random material model. Fig. 1b shows such a model using a random distribution of pixels/voxels defined on a computational grid and Fig 1c) displays a more realistic model using a random distribution of ellipsoids/spheroids representing a random distribution of aggregates (see [9, 11, 12] for first EFIT modeling results for concrete). Fig 1: a) cross-section of a concrete sample; b) random mode using a pixel/voxel distribution on the used grid system; c) random model using a random distribution of ellipsoids/spheroids with different sizes, orientations, and fillings. To generate such geometry models we developed a 2-D/3-D geometry generator which generates a random distribution of ellipsoids/spheroids defined on a 2-D/3-D surface/volume material grid. The ellipsoids/spheroids can vary randomly in size and orientation and can be filled with different aggregate materials. The random distribution of aggregates is computed according to a selected grading curve. Fig 2: a) spatial staggered grid complex; b) temporal staggered grid complex; c) discrete Cartesian field components with 1 = x, 2 = y, and 3 = z. Fig. 2 makes clear that we discretize a 3-D concrete test specimen in small volume cells called voxels. If the region of interest, the part of the concrete sample which is under evaluation, is very large, then the number of volume cells as well as the number of unknowns are very large. This means that a computer system with sufficient main memory is required. To handle large 3-D grid systems we recently installed a Beowulf compute cluster with 16 nodes connected via 1Gbps Ethernet. Each node consists of a single processor board with a Pentium IV, 3GHz, 800MHz system bus, and 1GBRAM; in total 16GBRAM can be used for simulations. The compute cluster represents a distributed memory computer. In order to run our EFIT code on such a distributed memory computer system we developed an MPI version of our EFIT code, where MPI stands for Message-Passing Interface [4, 5, 17]. On our computer systems which run Windows XP or Linux we use the freely available MPI implementation named MPICH . In many real-life NDT-CE situations the numerical modeling of the ultrasonic wave propagation and scattering must be restricted to a finite sub-domain of the concrete sample. For these cases it is necessary to implement an absorbing boundary or an absorbing layer at the boundaries of the computational grid which is always of finite size. We have implemented the open boundary condition by Higdon  as an absorbing boundary and the perfectly matching layer (PML)  as an absorbing layer. For the numerical modeling of nondestructive testing procedures different measurement techniques are implemented, for instance, common techniques like the pulse-echo and pitch-catch technique as well as LLT or TOFD [14, 17]. 2-D and 3-D EFIT modeling results of the numerical modeling of ultrasonic wave propagation and scattering can be found in [9-14] and references therein. Further examples are given in [7, 19, 20] and references therein. An ultrasonic phased array system using commercial probes with a center frequency of 200 kHz has been built at the Federal Institute for Materials Research and Testing (BAM). We have implemented a special transducer model for the phased array system with adjustable amplitude and phase tapering and performed several EFIT simulations for different material configurations. Results can be found in . For the validation of imaging algorithms applied in ultrasonic NDT-CE carefully designed and well-defined concrete samples are needed. The fabrication of such concrete samples needs a lot of resources. These efforts can be minimized by using synthetic data generated by computer simulations for a first validation step. In collaboration with the Federal Institute for Materials Research and Testing (BAM) we performed a parameter study to design an optimal concrete test sample for this task. 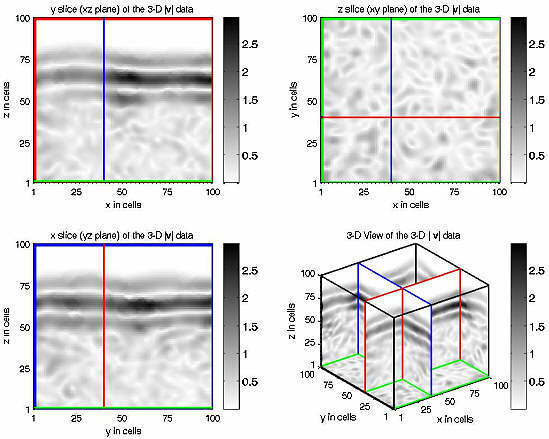 The EFIT simulation comprises a pulse-echo experiment for 90probe positions and a 2-D grid of 4000x1400 cells which corresponds to a sample size of 1000x350mm. The computations were performed on a Sun parallel computer system at the University of Ulm, Ulm, Germany. The computational time was ca. 380CPUhours. By varying the material properties we are able to differentiate between the influence of multiple scattering effects and effects which are inherently given by the Synthetic Aperture Focusing Technique (SAFT) und FT-SAFT (Fourier Transform-SAFT) (see  for FT-SAFT applied in electromagnetic NDT-CE and references therein). Fig. 3 shows a result out of 8 simulations for a concrete sample with a grading curve A16 and an air concentration of 2% (see Fig. 3a). A selected snapshot of the ultrasonic wavefield is displayed in Fig. 3b. At the displayed time point the pressure wave is reflected at the backwall. The white spaces represent the backwall-breaking notches. Fig. 3c displays a B-scan obtained from 90 pulse-echo simulations. The backwall can be recognized at t @ 150ms and the echoes from the notches are visible at t@ 130ms. In the reconstruction in Fig. 3d) the upper flat surfaces of the notches are displayed at a depth of 300mm which are detectable from a width of 20mm. This result motivated the reduction of the sample depth from 350mm to 250mm. 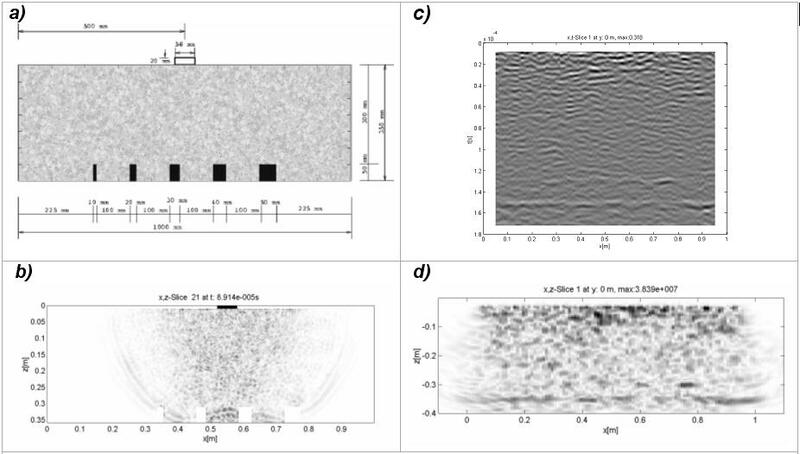 Fig 3: a) 2-D geometry of a planned concrete sample with different backwall-breaking notches; b) 2-D wavefield snapshot; c) B-scan image; d) FT-SAFT reconstruction. Several simulations were performed with different material configuration and reconstructions were computed with FT-SAFT. The FT-SAFT reconstruction of the synthetic data for the modified sample depth is shown in Fig. 4 and, in contrast, Fig.5 displays the FT-SAFT reconstruction of the experimental data (see also ). Due to the smaller depth the S/N ratio increases and a better resolution is obtained. A reconstruction of the experimental data obtained for the test sample BAM NB 3 displays an even better resolution. This is due to the fact that the scattering amplitude of a cylindrical air inclusion (2-D) is higher than that of a spherical air inclusion (3-D). 3-D EFIT simulations are impossible at the moment because of the huge memory requirements and computational time. Nevertheless, we developed a Message-Passing Interface (MPI) version of our EFIT code to perform such real-life 3-D simulations. First results are discussed in the following section. Fig 4: FT-SAFT reconstruction using synthetic data of a modified test sample. Fig 5: FT-SAFT reconstruction using experimental data (150 kHz) of a realized test sample BAM-NB3 (x=0 is not adjusted). Fig.6 shows a 3-D concrete model generated with the developed 3-D geometry generator. 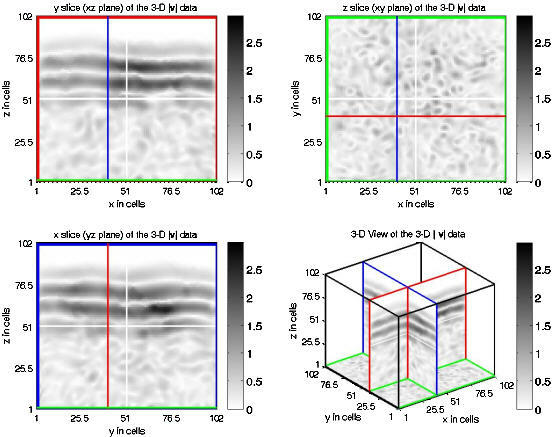 In a first example we consider a relatively small 3-D grid of 100x100x100 cells. We used a grading curve A16 and three different aggregates. We simulated a plane wave excitation with the standard and the MPI version of 3-D EFIT. In the simulation with the standard version we applied a plane wave boundary condition at the vertical boundaries and in the simulation with the MPI version a PML boundary at all boundaries except the boundary at x = 0. Fig.7 displays the results for the standard version and Fig. 8 gives the results of the MPI version where we used a Cartesian MPI topology of 2x2x2=8 computational nodes. The results differ in some details because of the different boundary conditions. For example the absorbing effects of the PML boundary condition are visible clearly in the x slice and y slice given in Fig. 8; the backwalls in the 3-D view in Fig. 8 are also white. The white crosses in Fig. 8 indicate the positions of the MPI communication boundaries. These results obtained on our recently installed compute cluster are very promising and we are now ready to simulate real-life 3-D concrete structures. 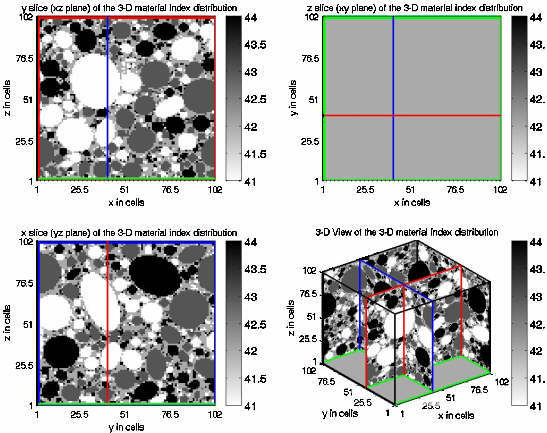 Fig 6: 3-D material index distribution as an output of the 3-D geometry generator defining the geometry of a 3-D concrete sample for the 3-D EFIT modeling. Fig 7: Computer simulation of ultrasonic wave propagation in concrete using the standard version of the 3-D EFIT code. Fig 8: Computer simulation of the ultrasonic wave propagation in concrete using the MPI version of the 3-D EFIT code. The white crosses indicate the MPI communication boundaries. Here a Cartesian topology of 2 x 2 x 2 = 8 computational nodes is used. We have presented computer simulations of the ultrasonic wave propagation and scattering in concrete using the Elastodynamic Finite Integration Technique (EFIT). The EFIT scheme is very robust, stable and flexible concerning the handling of complex materials and boundary conditions like the absorbing layer (PML). The results show that EFIT is a very successful tool for the simulation and optimization of real-life ultrasonic NDT-CE situations, even in 3-D, when using the MPI version. The presented work is part of a project within the framework of a German Research Council funded research group (FOR 384, www.for384.uni-stuttgart.de) which is also supported by several industrial companies. We would like to thank Dr. M. Krause, D. Streicher, and F. Mielentz of the Federal Institute for Materials Research and Testing (BAM), Berlin, Germany for their fruitful collaboration. F. Collino, Ch. Tsogka, Application of the PML Absorbing Layer Model to the Linear Elastodynamic Problem in Anisotropic Heterogeneous Media, Report, No. 3471, Unité de Recherche INRIA Rocquencourt, France, 1998, (www.cerfacs.fr/emc/collino/collino.html). A. T. de Hoop, Handbook of Radiation and Scattering of Waves, Academic Press, London, 1995. P. Fellinger, R. Marklein, K.-J. Langenberg, S. Klaholz, Numerical modeling of elastic wave propagation and scattering with EFIT - elastodynamic finite integration technique, Wave Motion, Vol. 21, pp. 47-66, 1995. W. Gropp, E. Lusk, A. Skjellum, Using MPI - 2nd Edition - Portable Parallel Programming with the Message-Passing Interface, The MIT Press, Cambridge, Massachusetts, 1996. W. Gropp, E. Lusk, A. Skjellum, Using MPI-2 - Advanced Features of the Message-Passing Interface, The MIT Press, Cambridge, Massachusetts, 1999. R. L. Higdon, Absorbing Boundary Conditions for Acoustic and Elastic Waves in Stratified Media, Journal of Computational Physics, Vol. 101, pp. 386-418, 1992. J. Kostka, R. Hannemann, R. Marklein, K. J. Langenberg, Ultraschallmodel-lierung mit EFIT: T-Stringer, Beton, rückwandverbundene Risse unter-schiedlicher Orientierung, in Vorträge und Plakatberichte; DGZfP-Jahres- tagung 1997, Dresden; Zerstörungsfreie Materialprüfung, Berichtsband 59.2, pp. 649-958, Deutsche Gesellschaft für Zerstörungsfreie Prüfung, Berlin, 1997. J. Kostka, Simulation and Inversion of the Propagation of Elastic Waves, Shaker Verlag, Aachen, (www.shaker.de), Germany, Doctoral Thesis, University of Kassel, Kassel, Germany, (in German). K. J. Langenberg, R. Bärmann, R. Marklein, S. Irmer, H. Müller, M. Brandfaß, B. Potzkai, Electromagnetic and elastic wave scattering and inverse scattering applied to concrete, NDT & E International, Vol. 30, No. 4, pp. 205-210, 1997. K. J. Langenberg, R. Marklein, K. Mayer, Applications to Nondestructive Testing with Ultrasound, in E. R. Pike, P. C. Sabatier (eds. ),Scattering: Scattering and Inverse Scattering in Pure and Applied Science, pp. 594-617, Academic Press, London, UK, 2002. R. Marklein, K. J. Langenberg, R. Bärmann, M. Brandfaß, Ultrasonic and Electromagnetic Wave Propagation and Inverse Scattering Applied to Concrete, in D. O. Thompson, D. E. Chimenti, Review of Progress in QNDE, Vol.15B, pp. 1839-1846, Plenum Press, New York, 1996. R. Marklein, Numerical Methods for the Modeling of Acoustic, Electromagnetic, Elastic and Piezoelectric Wave Propagation Problems in the Time Domain Based on the Finite Integration Technique, Shaker Verlag, Aachen, Germany, (www.shaker.de), Doctoral Thesis, University of Kassel, Kassel, Germany, 1997, (in German). R. Marklein, The Finite Integration Technique as a General Tool to Compute Acoustic, Electromagnetic, Elastodynamic, and Coupled Wave Fields. In W. R. Stone (ed. ), Review of Radio Science: 1999-2002 URSI, IEEE Press and John Wiley and Sons, Piscataway and New York, pp. 201-244, 2002. R. Marklein, K. J. Langenberg, K. Mayer, EFIT Simulations for Ultrasonic NDE, in: Proc. of the ECNDT 2002 Conference, CD-ROM, Barcelona, Spain, 2002. K. Mayer, A. Zimmer, K. J. Langenberg, Ch. Kohl, Ch. Maierhofer, Nondestructive Evaluation of Embedded Structures in Concrete: Modeling and Imaging, Proc. of the NDT-CE, CD-ROM, Berlin, 2003, (this volume). F. Mielentz, M. Krause, R. Boehm, H. Wüstenberg, K. Mayer, R. Marklein, Experimental and Theoretical Investigation to Optimize an Ultrasonic Phased Array for Low Frequencies, Proc. of the NDT-CE, CD-ROM, Berlin, 2003, (this volume). F. Schubert, Propagation Characteristics of Ultrasonic Waves in Concrete and Conclusions for Non-Destructive Testing, Doctoral Thesis, Dresden University of Technology, Dresden, Germany, 2000, (in German). F. Schubert, R. Marklein, Numerical Computation of Ultrasonic Wave Propagation In Concrete Using the Elastodynamic Finite Integration Technique (EFIT), Proc. of the IEEE Ultrasonic Symposium 2002,Munich, CD-ROM. D. Streicher, M. Krause, Ch. Kohl, M. Schickert, O. Kroggel, W. Müller, Parameters for the Quantitative Assessment of Ultrasonic Imaging for Concrete Elements, Proc. of the NDT-CE, CD-ROM, Berlin, 2003, (this volume).